I almost called these sticky toffee pudding shakes, based on the classic British dessert that gets its caramel-y goodness from soaked dates. But I figured that might get a little lost in translation if you didn’t grow up in the land where “pudding” means dessert instead of something cold, creamy and kinda spongy in a cup. So I went with Salted Caramel Date Shakes instead. Because these date shakes are super simple and get their natural caramel flavor from, well, dates. Specifically, fudgy Medjool dates, aka nature’s straight up candy. As a result, they don’t need any added sugar. But if you’re eagle eyed, you’ll notice the unsweetened banana chips in the photo. Not that you can tell they’re unsweetened just by looking at them. But, they are unsweetened because the usual grocery standard banana chips are not only sweetened and often in less than stellar oils, but they’ve usually got two words on the label that I try to avoid. “Banana flavor”. Because, really, I’m thinking that I don’t want to know where banana flavor comes from and the AIP avoids those kinds of additives. So why am I adding in banana chips to the it-needs-no-added-sweetener-smoothie-situation here? 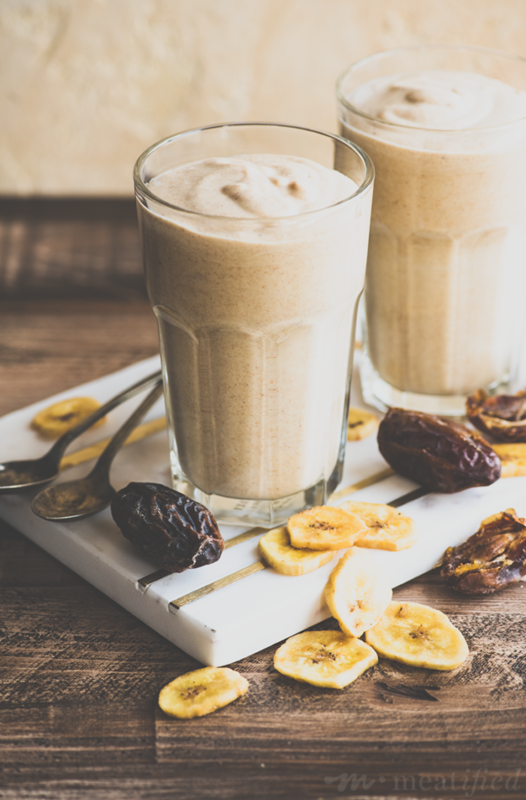 Well, if you look around at attempts to veganize or dairy-free-ify the classic, humble date shake, you’ll find they usually have either fresh or frozen banana in ’em or raw soaked cashews. Why? Mostly to help thicken things up a bit to give a nod back to the days when shakes were full of ice cream and we didn’t know they could be made any other way. So here, my Salted Caramel Date Shakes are made by soaking both the dates and the unsweetened banana chips, rehydrating them enough to give them a good go in the blender and thicken these bad boys up. They’re still slurpable by straw, but nowhere near as thin as they would be made with plain, emulsifier and gum free coconut milk, plus ice. To amp up the natural caramel flavor of the Medjool dates, I spiked these date shakes with a little vanilla powder, mace and cinnamon. And a good, generous amount of salt. Personally, I’m a sucker for the sweet & salted combination and I like to use the full amount of salt given in the recipe below. But I suggest you whip up your date shakes with the smaller amount of salt first, taste and adjust as needed. Because there’s nothing worse than something that’s too salty. One of life’s little food ironies when you love a good sprinkle of salt on things! If you really wanna go all out, top the Salted Caramel Date Shakes with a scoop of chilled whipped coconut cream, a sprinkle of date sugar and an extra pinch of cinnamon. And a big ol’ long stemmed spoon to help stir that good stuff in. But don’t forget a straw like I did! Now, as an added boost, I threw a couple of scoops of collagen peptides into the mix, too. It’s totally optional, but this is a great place to hide some added goodness and helps thicken up the shake just a little more. SOAK: Add the dates and banana chips to a small bowl and pour over enough hot, just boiled, water to cover. Soak for 15 minutes, until the dates and banana chips have softened and the water is tinted caramel color. BLEND: Drain the dates and banana chips, then add them to a high powered blender pitcher, along with the coconut milk, ice, collagen, mace, cinnamon, vanilla and half of the fine sea salt. Blend until smooth and creamy, then taste. If you would like a stronger salted flavor, add the remaining half of the salt and blend again. SERVE: Divide the salted caramel date shake mixture between two glasses. If you like, top with a scoop of coconut cream, a sprinkle of date sugar and a pinch of ground cinnamon. For a super cold shake that’s not watered down by adding extra ice, you can also make the smoothie ahead of time and chill for an hour or so before serving. I’m allergic to banana. Is there something I can substitute? Why not use regular bananas rather than having to rehydrate the chips?